As the run off from the last spate fines down and the water becomes ever clearer we are starting to see salmon and sea trout in the pools. If it wasn’t for the wind ruffling the surface of Willows (Milton Beat) earlier today Michael Dawnay, one of our syndicate rods, and I might have seen a shoal of sea trout at the head of Upper Boast Pool. I am sure they are there, but not yet in big numbers. I can say however that there are some big sea trout in the pools, notably Tollmuir and Indies, and that the late spring run of salmon continues. Derek had a very nice plump little 7lbs salmon from Red Brae (Castle Beat) on 30/5, which followed one of 6lbs he had from the same pool earlier. He finished the day with another split-fresh 8lbs salmon from the stream into Pheasantry (Castle Beat). All these fish were caught on a size 12 cascade. In less than a day therefore the season’s tally for Castle Beat has more than doubled. Well done Derek! With the grass freshly cut on the N bank of Indies (Indies Beat) and all the way downstream to Tollmuir Pool (Bogardo Beat) the river and its surroundings are looking great. The last week has been strange weatherwise, explained by meteorologists as caused by the jet stream overhead and resulting pressure-induced high winds with some rain. Trees have been brought down, branches broken and an unseasonal flurry of autumn-like leaves scattered into the river by huge gusts, with their catspaws ruffling the surface of the pools. With water levels at a generous late spring level, and the water clean after the last two weeks of rain leaching of the topsoil, the river has been in perfect condition. Not many fish have been seen, but we caught seven up to 12 lbs, with Frank’s Stream on Indies Beat and Tyndals Pool on Milton Beat doing well. Late flurries of activity from small shoals running through the beats have been seen late in the day in the evening light, especially in the Red Brae. Salmon have been hooked and lost in Tyndals, Indies and Tollmuir Pools and quite a few, more than anywhere else, seen in Marcus House Pool. This is the view from the head of the Flats (Milton Beat) downstream towards Castle Stream footbridge and Red Brae (Castle Beat) beyond. Seven fish isn’t bad for a late May week at Finavon, but in the context of this year’s much improved spring run, it was mildly disappointing. We should I believe have caught a dozen salmon and a few more sea trout. 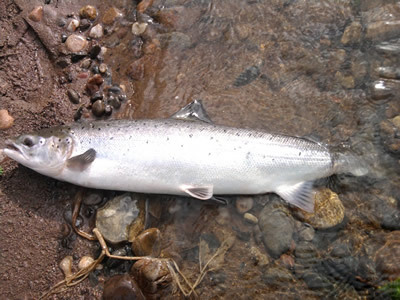 Ken Dickinson reported some big sea trout in Tollmuir Pool, including a really big fish well into double figures. 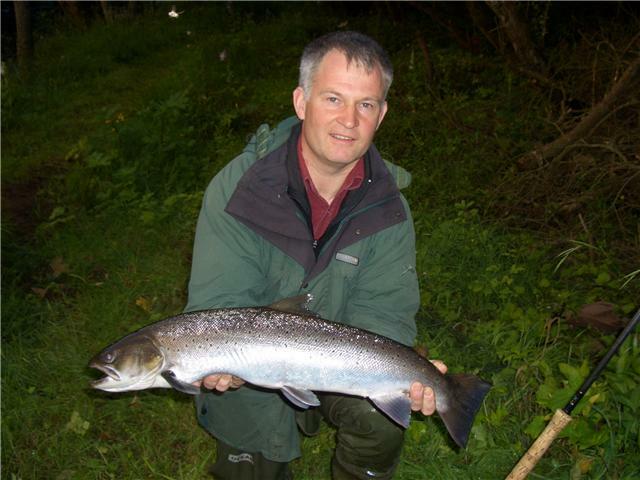 On the same occasion Bill Cook hooked a nice spring salmon off the big boulder in the same Pool, but the fish decided it would return to Montrose Basin and left Bill bereft in the process. Inside the Bogardo Beat hut which is located on the South bank of the tail of Haughs Pool (Bogardo Beat). As I write this bulletin on Sunday evening the wind is still breaking branches and the river is fining down, but still very fishable. 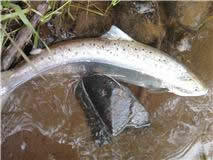 If the weather warms up a bit we should start to catch sea trout in the dusk and, later in the month of June, at night. I expect Inshewan, Cortachy & Downie Park to strat reporting good sea trout catches in the next few days. 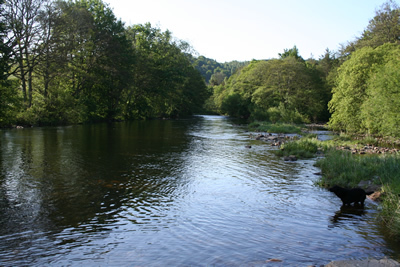 Meanwhile, the four FCW sea trout syndicates who will be fishing all the pools downstream of the Haughs Aqueduct, start their season on the 6th of June and, ever optimistic, I am predicting a better sea trout season here than any in the last five. I am off to Greenland to attend the NASCO conference for a week on Thursday. Depending on whether there is something to report, I may slip in one more blog before I go; otherwise, it will be after the 10th of June when the next bulletin arrives. In the meantime, to all our rods at Finavon, and elsewhere on the South Esk, tight lines! Three fish on Saturday and another spate on Sunday. Saturday the 21st of May proved to be eventful, despite the low water. Whilst it wasn’t quite summer low conditions, the river was only 2″ above that level which gave us the impression that we might be returning to a ‘difficult’ period of persuading fish to take the fly. As it happened we were wrong and three nice salmon to 11 lbs were caught, two of them in the late evening. The pools producing these fish were Tollmuir (Bogardo Beat), Tyndals (Milton Beat) and Melgund (Indies Beat). One of the features of this spring is how spread out over the four beats the catches of salmon have been. Normally Milton Beat is the highest scoring beat at this time of year, but the 2011 season has seen a welcome return to form of the lower beats, which means that rods fishing the four beats on rotation all have a good chance of a fish. I’m not going to get too excited yet about the numbers of early-running fish this year, although I hear that George Pullar’s nets at Montrose are doing very well. Where I think there are really encouraging signs is in the quality of the MSW fish caught this spring. All our fish, with the exception of the terribly wounded one I caught back in March, have been in tip-top condition. I guess that Professor Chris Tod of the Scottish Oceans Institute at St Andrews University would grade them at something like 0.95 on his condition scale, which is pretty good, if not excellent. Clearly these early returning MSW fish have been dining well, wherever it is that they have been feeding (probably somewhere northwest of Iceland, or even as far away as the Greenland fjords)! The photograph above of the view looking down Tyndals was taken at 1230 on Sunday 22 May. Compare this picture with the one of the same view taken in the early morning on Saturday. Prospects for our sea trout. There has been some rain and a lot of topping-up showers over the last two days, with the result that we have a nice little spate running as I write this at 1600 on the afternoon of Sunday 22 May. I said in a previous blog that the ideal time for a spring spate is the first weekend in May. So it is, but the third weekend will do just as nicely! What we don’t want is another whacking great lift in the river just as the main shoals of sea trout are entering the river. Ideally these incoming sea trout should be filtering into the pools in stages, establishing shoals in the famous pools from Cortachy down to Kinnaird. 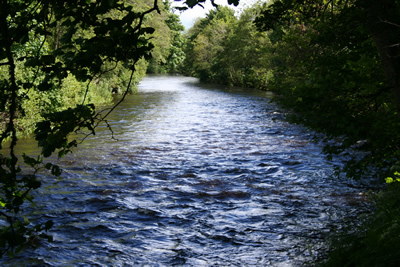 Usually the middle to upper river – Kintrockat, Careston, Finavon, Inshewan and Cortachy/Downie Park – benefit from a steady filling up of the river in threse conditions. If we get a spate in (say) mid June or early July the shoals will tend to move quickly into the upper river, leaving only the rearguard in the lower middle river. In such conditions it is usually Cortachy that does well, although I concede that Cortachy and Downie Park are the only beats in the last few years that have been consistently well fished by night anglers who really know what they are doing. 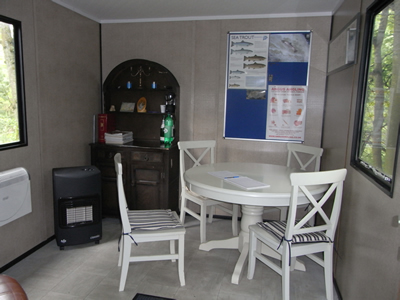 That will change in 2011 because Finavon now has four syndicates fishing throughout the sea trout season (mid June to mid August), and these fishermen are all-night anglers with experience of night sea trout fishing. It remains to be seen if we catch more fish! Posted in Uncategorized | Comments Off on Three fish on Saturday and another spate on Sunday.